Copyright © Black Curtain Studio. All rights reserved. 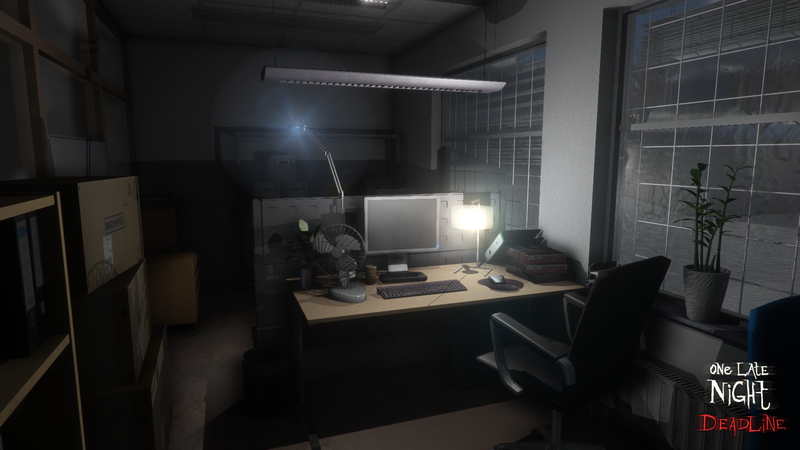 One Late Night: Deadline continues the story of One Late Night, a horror/mystery game where you play the role of an office worker caught in the middle of the paranormal activity that has broken out in a seemingly ordinary office building. Freely explore the 5 story office complex that houses several different companies. Look for clues around the offices, read newspapers about local events, hack your colleagues emails – anything that might tell you something related to the strange happenings. You arrive at your work late in the night. The rain is pouring down and a storm is closing in fast. Everyone has gone home for the day a long time ago, but the lights in the lobby are still on as usual. 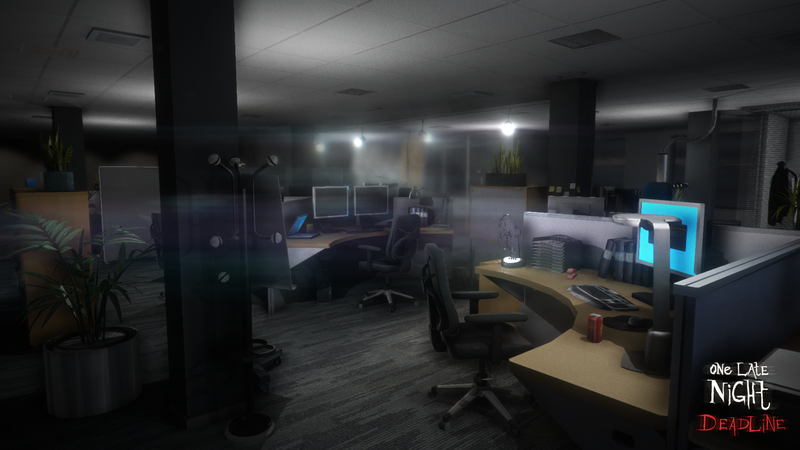 As you enter the office complex through the main entrance, you immediately feel the emptiness and begin to go over in your head "what the hell you are doing here in the middle of the night? ", when you could be at home getting some well-deserved sleep. However, while your mind is clouded with the details of your precious deadline, you are unaware of lurking danger in the building and what has occurred during the night. Something has been set free; something that's not from the world of the living. 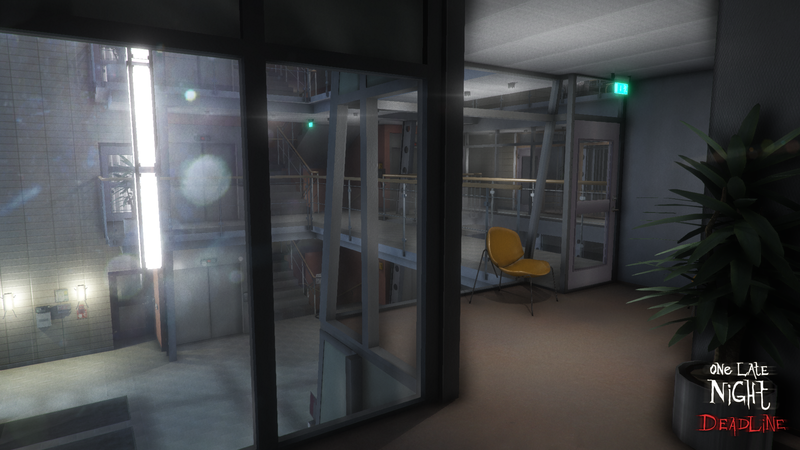 The shadowy and long hallways beckon you as you attempt to unravel the mystery that has befallen the unassuming offices. Has everyone really gone home, or is someone or something still here? The entire game revolves around completing objectives and other small tasks. These objectives may trigger at certain points in the game or by witnessing certain events. The objectives does not all have to be completed in a linear fashion, and some does not have to be completed at all. You can use your cellphone as a light source in dark areas and shine in the direction you look. You do not have to go on a tedious battery hunt for the flashlight, but it will drain over time. The battery will replenish automatically over time after you put away the cellphone. This will be indicated by a battery meter at the top of the screen once it is in your possession. One Late Night: Deadline brings you a parallel dimension where you might see things otherwise not visible to the naked eye. So, if things look bleak and you’ve lost your way, use your cellphone to tap into this mysterious second dimension and things will soon become clearer. But beware; you might see more than you wished for. Along your way you will come across computers that can be manipulated. You can use these computers to gather clues and information by reading employee emails. However, some computers are locked and require you to use a password, but if you are stuck you can try to hack them. If you find a Hack disc it will help you immensely in the hacking process. When your eyes grow weary and you begin feeling tired, you can head for the nearest vending machine to replenish your energy. If you move around for too long without having a drink you will eventually collapse from exhaustion. Running will make you tired much faster. If you are lucky you might find Dexterity tablets that you can eat along the way and instantly restore your energy. All security doors are unlocked using keycards. This is the lowest form of security in the building. Some doors also require a code. You start out with a default keycard that lets you in through some doors. You can save the game progress by using the coffee machines located conveniently around the building. Read the newspapers that are lying littered around the building; they will teach you about local events from the outside world. 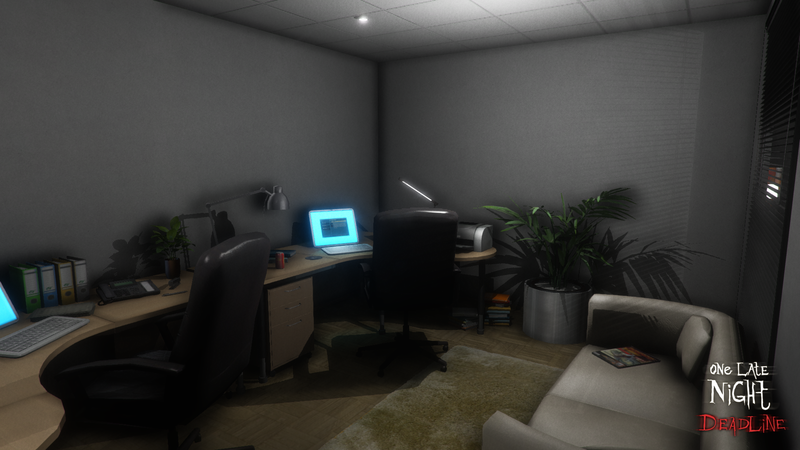 All the environments are designed from a real-world perspective. You choose the outcome of the game by the decisions you make.